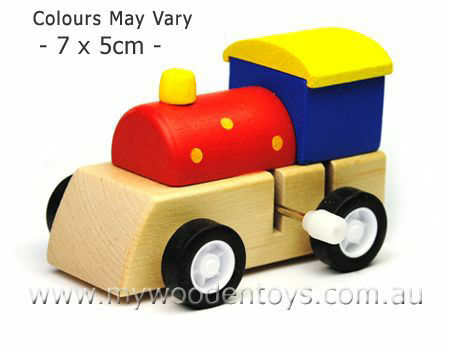 Wooden Wind Up Train is a sweet little wooden locomotive with a strong clockwork wind-up motor. This wonderful wind-up has a smooth wooden body and rubber wheels. It is wound by using the attached winder (no key to lose) and off it goes. During our extensive playing (I mean testing) my daughter and I got it to run for over 4 meters and because of the rubber wheels it can also climb slopes. Size: 7cm long x 5cm high x 5cm wide. Material: Wood, Metal, Rubber wheels. We like this because: "Fantastic toy very strong motor. A wooden Wind-up brilliant!"